Penn State Milton S. Hershey Medical Center is one of the first hospitals in the area to use a new, minimally invasive tool to treat brain aneurysms and prevent stroke. The Pipeline Embolic Device (PED) is part of a new class of devices called flow-diverters, which treat brain aneurysms in an endovascular fashion, without the need to access the aneurysm itself. Brain aneurysms are typically sack-like out-pouchings that arise from cerebral arteries. A subarachnoid hemorrhage, the type of stroke that results when an aneurysm ruptures, is particularly devastating, carrying a 40-50 percent thirty-day mortality rate and leaving approximately one-third of the survivors disabled. The Pipeline Embolic Device is used to prevent such a stroke. The device, a mesh-like Nitinol tube—similar to a stent—is placed in the parent artery across the base of the aneurysm outpouching. Over time, blood flow into the aneurysm is reduced, or diverted, allowing the aneurysm to clot off. The clotting prevents the aneurysm from rupturing, and eventually leads to shrinkage of the aneurysm. Kevin M. Cockroft, M.D., M.Sc., co-director of Penn State Hershey Stroke Center, has been utilizing the Pipeline Embolization Device for about two years. Cockroft also serves as a physician proctor for the new device and has trained other physicians in its use. Not only is the Pipeline procedure an alternative to an open craniotomy and microsurgical aneurysm clipping, but it is also an alternative to endovascular coil embolization. Like coil embolization, a small incision is made in the groin and a catheter is placed into the femoral artery. From there, a series of successively smaller catheters are guided into the intracranial circulation and finally to the area of the aneurysm itself. In the past, doctors would embolize an aneurysm by packing it with coiled platinum wire. However, for some large or broad-based aneurysms, coil embolization would not be possible or, even if initially successful, would later lead to a high rate of recurrence. Cockroft said the new procedure is more promising for use in higher risk patients whose aneurysms may grow back, or for larger aneurysms not easily filled longterm by coils. 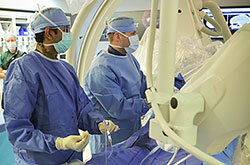 “Once the aneurysm is closed off, it never comes back; the Pipeline device is a more permanent treatment,” he said. Because the Pipeline device requires use of antiplatelet drugs – and it does not result in immediate occlusion of the aneurysm – the device is not typically used to treat recently ruptured aneurysms.